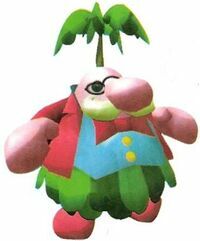 The hotel manager, also called the hotel proprietor or simply the manager, is a white-mustached, pink Pianta that manages Hotel Delfino, along with two small huts, on Sirena Beach in Super Mario Sunshine. As the game progresses and misfortune continues to befall both Sirena Beach and Hotel Delfino, the hotel manager becomes increasingly concerned. As such, he is quick to enlist the help of Mario to sort out the current predicament on several occasions, though he is not always exactly forthcoming, sometimes requesting Mario's help in indirect or roundabout ways. Nevertheless, he is always appreciative of Mario's assistance, and often makes a point of telling him so. His luck first takes a turn for the worse in Sirena Beach's Episode 1, when Phantamanta engulfs Sirena Beach in Electric Goop, sinking Hotel Delfino underground and trapping hotel guests. Throughout the remaining episodes, the hotel manager encounters a number of other issues, ranging from Boos haunting various parts of the hotel to Shadow Mario running amok in the hotel. In the Super Mario Mash-Up Pack in Minecraft, Blacksmith Villagers are replaced by the Hotel Manager. ↑ Hodgson, David S J, Bryan Stratton, and Stephen Stratton. Super Mario Sunshine Prima Official Strategy Guide. Pages 123 and 124. ↑ Hodgson, David S J, Bryan Stratton, and Stephen Stratton. Super Mario Sunshine Prima Official Strategy Guide. Page 116. ↑ Hodgson, David S J, Bryan Stratton, and Stephen Stratton. Super Mario Sunshine Prima Official Strategy Guide. Page 117. This page was last edited on June 15, 2018, at 15:09.